Mixer Jeff Juliano has used a lot of different speakers, and in the past 10 years he’s relied on the supposed ‘industry standard’ Yamaha NS10. But no more. Juliano recently tried the Focal Twin 6 Be powered monitors at his Delaware mixing studio and has now made them his number one choice. 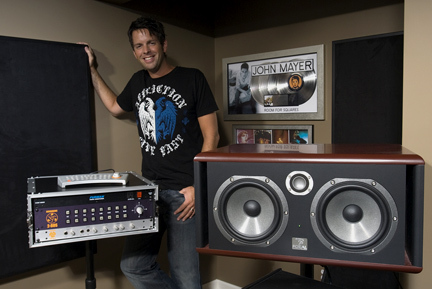 Having mixed a host of platinum-selling albums for artists such as Jason Mraz, Josh Kelly and Lifehouse, as well as John Mayer, who won a 2003 Grammy for his album “Room for Squares” which he mixed, Juliano has a great ear for sound, but was ready for the change. “I’ve been going through so many speakers in my time mixing, I was an NS10 guy for so many years, and started to believe that was the only speaker in the world that mattered. The Focal Twin 6 Be monitors are the best that I’ve used in terms of studio-to-consumer listening translation for car stereos, clock radios — iPod ear buds, you name it. They really translate: what I hear in the studio is what the outside world hears, in my experience. When I go to the car and check a mix, it’s what I hear in the studio. That’s the end-all, that’s what matters,” stated Juliano.